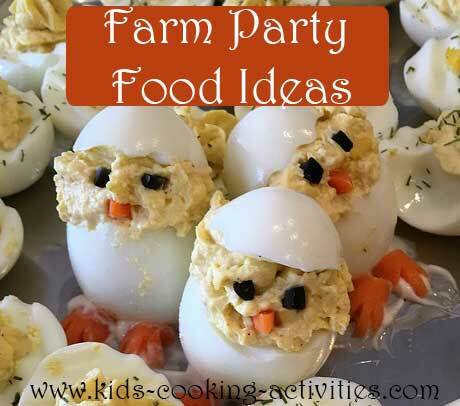 These farm party ideas include eatable recipes that the kids will enjoy putting together. Getting the kids involved in the decorating, creating centerpieces and making these easy recipes can be a great activity for them. Also include a dinner menu and invitation for the farm party. Use the edible vegetable garden below as a centerpiece. Create a farm scene with kids toys and a barn made out of cardboard. Put the kids in charge of creating the design. Using an empty oatmeal container create a farm silo and place toy animals around playing in the farm yard. 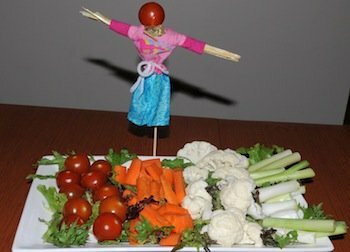 Create a mini vegetable garden and fashion a scarecrow for this farm theme dinner. Once you have your salad greens on the bottom and rows of vegetables add a little character in your garden by creating a scarecrow. We made ours with a green onion stem and a wooden skewer. Then used barbie doll clothes and a few pieces of hay stuffed in. Place the skewer in a piece of carrot or whatever hard vegetable you might have. This makes a great centerpiece for your farm party! Going with the vegetable garden theme. Arrange fresh chopped vegetables on a skewer. 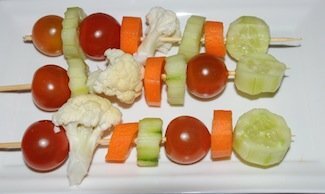 Cherry tomatoes, cauliflower or broccoli tops, cucumber circles, fresh mushrooms all work well on skewers. Once your boiled eggs have cooled, cut the top off the eggs and scoop the yolk into a bowl. Save the egg white tops for later. Be careful not to damage the boiled egg while doing this! Prepare egg salad with the egg yolks. Line your serving plate or platter with greens. 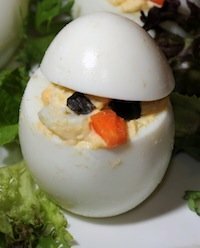 Stuff each boiled egg with egg salad making it rounded on the top for his face. Place on a platter. 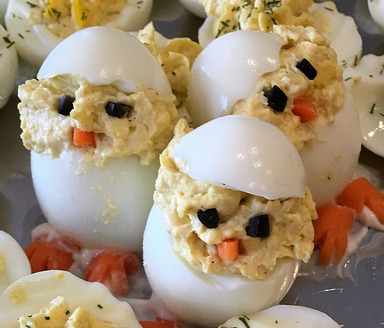 Cut small dots out of olives for eyes and a small triangle for a beak. Place on to the top of your egg salad. Add the egg white top on the egg salad head. 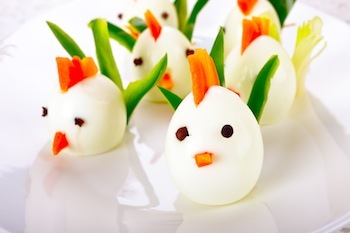 This is another hard boiled egg idea but works great for the farm theme! Use cut pepper slices for beaks, tail and tuft on top. Small pieces of olives can be placed inside a small cut for eyes. Any of our apple recipes would work well for a farm theme as many farms have apple orchards. Make fresh butter and homemade biscuits to go with it. Make homemade bread and talk about how farmers grow the wheat that gets ground into flour. 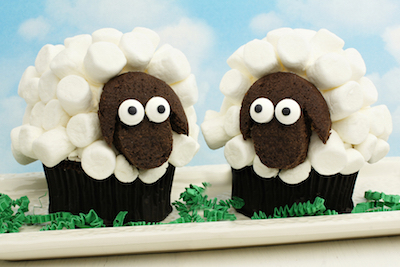 These lamb cupcakes are super easy. Prepare cupcakes with black cupcake wrappers. Place a second cupcake (make sure it doesn't have a cupcake wrapper on it!) on top of a cupcake. Add icing to the bottom cupcake to keep the top layer in place. Frost the entire top and sides of top cupcake and press mini marshmallows into the top layer. Leave a space for the face. With extra cupcakes cut out a lamb shape face out of the tops. Add candy eyeballs to the face by attaching with frosting.